Installed new hoses, drier, evaporator core in my 71 car. Flushed condenser very good. Flushed compressor with mineral oil. Took it to local mechanic shop. The pulled a vacuum and let it set for 2 to 3 hours, no leaks. Charged it with 3lbs R-12. On the drive home it blew cold for a couple of miles then started blowing warm. Got it home and checked my pressures. Low Side don't Remember it was either 35 or 25 psig. Added 6ou R-12 started blowing cold again, vent temps 45F with 85F outside temp. Pressures then read 175psig high side and 30psig low side. Left on a trip, drove about 150miles (2hours), ac working great. Then started blowing warm, about 70f, then 80f (outside temp). Left system off for a couple of hours. Turned it on again and it works but vent temps won't go below 50f. If I increase engine rpm to 1500 and hold there for about 10 minutes, low side pressure starts to drop a couple of lbs then go back up 1 and back down 2 to 3 lbs until it reachers about 32psi. Vent temps still about 50f maybe 52f. Any ideas what's going on here. Sight glass is clear. Sounds like a typical leakage scenario. You must find the leak, and fix it, or you'll never have a decent system. First problem I have is identifying your system, GM had something like five different systems in that era, sure helps to peek under the hood. Sight glass hints of a receiver that would have a TXV valve along with either a POA or an STV valve. Either or both of these can be acting up to cause your crazy pressure problems. You stated the system held the vacuum for a couple of hours then three pounds of R-12 were added. Did you do that at home or was that done at the shop with a charging station? The former hints at adding air to the system that would also give crazy pressures. Be more detailed on which system you have and how it was charged. Sorry for my poor memory on exactly which system a vehicle has. I think that will be a POA system. Could have a balky POA valve (stuck closed) or TXV. Is the TXV sensor bulb properly attached to the side of the evaporator outlet pipe and well insulated from outside heat? Heat from the engine will throw off the TXV operation. If you disconnect the evaporator fan, low side should drop to 28-30 and stay there. May need to remove POA valve and test it with air. 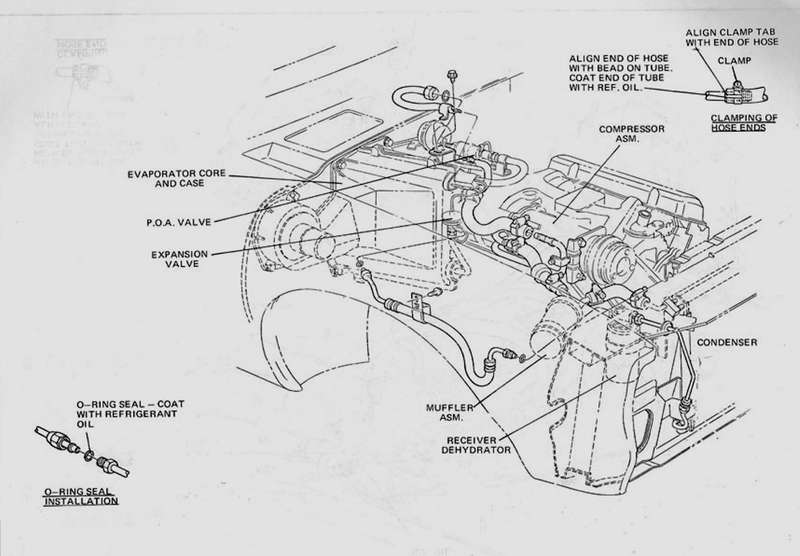 Recall my 70 Buick was an STV system, manual had a nice flow diagram of the AC system with a good explanation, but that manual with that car is ancient history now. Never had a problem with either a POA or STV valve, in that era, AC system was working great when the rest of the body rusted out so bad, was nothing left to hold the wheels on. But now we have a couple of guys here with apparently 1971 good cars, but with potential POA problems, this is going back 39 years. Do recall the compressor ran all the time, and somehow the POA valve would regulate the load on the compressor for good fuel economy. That 70 Buick, a 4,600 pound vehicle was always good for 20 mpg and had ice cold air. Really like that car until it got big holes in the sides. But I just can't seem to recall how the POA bypassed the refrigerant to the compressor. Did a net search for a refrigerant flow diagram, this is all I could find. If you can make heads or tails out of it. I was thinking I possibly overcharged the system. The site glass was a little cloudy after the mechanic shop charged it with 3lbs, which is what the book calls for. I added about 6 ou and the site glass cleared up and the system started working great. Right now the site glass is still clear. The system has the TXV, POA, and receiver. The site glass is in the top of the receiver. I did the work (flushing and installing new components). Then took car to local mechanic shop and let them pull the vacuum and charge it with R-12. You are correct the compressor runs all the time. The POA and TXV adjust to keep the evaporator from freezing up. I now have the TXV bulb located in the correct place. I had it incorrectly installed on the bottom of the evaporator line until a couple of days ago. It worked fin in the wrong place for a couple of hours. Could running it in the wrong location permanently damage it, or should it function correctly now? I tried to test it by placing it in a cold cup of water, then putting it in a hot cup of water. I was working by myself so in between switching cups of water I had to let off the accelerator and the rpms dropped. Even with this going on I didn't see any significant changes in pressure (less than 5 psig, high side or low side). Seems like TXV might not be not working but I am going to get some help tomorrow night and do a better test. Yesterday (ambient temp 85F) I disconnected the fan, with the ac running, the low side pressure dropped to 30psig so I think the POA is functioning. I tested the POA prior to installing it on the car following Mitch's procedure I found on the forum. I blew air through the TXV at 60psig, and read 30-psig at the low pressure fitting on the POA. One problem I might have created. When I added 6 ou freon the 1st day, I didn't purge my hoses (didn't know better). I hooked them up read the pressures, attached a can of freon to the middle hose, and opened the low side valve. So 2 hoses full of air were shoved into the system. Could this be my problem? Site glass is still clear. These readings seem closer to what I am looking for although the high side pressure is lower than it was last week (it was about 175psig). I like the vent temp, but it might just be the result of cooler ambient conditions. Thanks again for the help. AC systems are not my strong point. run the engine at 1200 to 1500 rpm for a minute or so after warm up. Then let it idle. Look at the sight glass. If it stays clear, charge should be ok. If it bubbles and then goes clear, you're slightly under charged. These systems did not have to be critically charged due to the drier also holds extra freon. An oz or two extra after the glass clears won't hurt. If you put the TXV bulb in ice water and then hold the bulb in your hand, if there is no difference in pressures, the TXV is bad. This is all done at 80ÃÂº F or higher. 48ÃÂºF on these vehicles were the norm. Anything less is golden. I'll check the sight glass as soon as I get home this afternoon. Do I perfrom the TXV test with the engine idling, or at a constant 1500rpm? Just tested TXV again. low side pressure swings about 5 psi as I heat the txv bulb, then cool it, or vice versa, so I believe its working. Didn't see any bubbles in my sight glass so I don't think i'm low or even close to low on freon. By now I have connected and removed the hoses 6 to 8 times, so I have probably lost a couple of ounces so I don't think I am significantly overcharged. I also unplugged my fan again and watched the low side pressure. It only went down to 37 psi. what readings do you get with the doors and windows closed? Low side should be 28 to 32 (30 optiminal) with blower motor disconnected. In answer to your question ref rpm for TXV test, I always used 1200 ish. This is a Corvette...make sure you place a 20 inch window fan in front of the grill area and blowing into the grill. Front airflow on 'vettes were always terrible. Also make sure your guages are zeroed. I'm guessing that if you close the car up, put a fan in front, your 1200 to 1500rpm readings along with vent temp will fall in line. Also, test your thermometer with ice water mixture to be sure it is accurate. This post is testing my memory, wish I could see a flow diagram of a POA system. Did watch a dumb movie last night, don't even ask me the name of it, forgot it already and best forgotten. Recall the POA has an inlet at one end, an outlet at the other, with side outlets for the TXV, an oil bleed, and the gauge port. Also recall it was internally calibrated for 29.5 psi at sea level, but would drop a half a pound for each additional thousand feet above sea level. What I can't recall is how it is plumbed into the system, regulated pressure is applied to the TXV meaning there is excess gas that is effectively bypassing something with a good side effect of easing the load on the compressor. Just can't recall what is being bypassed. If I could turn the clock back, just go out to my garage, open the hood and look. Is the POA bypassing the evaporator with these excess gases? Yesterday I had a low side reading of 40psi with the doors and windows closed, engine at 1500rpm, 77F ambient temp. I did not have a fan in front of the radiator/condensor. Thanks for input I will test again this afternoon with fan in front of radiator. I beleive I have a diagram of the ac system. I will post it tonight when I get home. Your descritiption of the POA is right on the money. I don't fully understand how the system works with regards to the TXV and POA interactions. I have been reading about them but still can't don't fully understand it. Thanks for taking interest to help me figure it out. Recall driving through the Dakota's in a POA system Buick in a 125* ambient with an interior temperature of 65*F, was really a great system. But heard rumors, never that cool in a Corvette, main market for that car was something like a kittycat wagon, not so great for cooling. Unlike a CCOT system in those kind of ambients where low side pressure can exceed 75 psi, POA held that pressure in that 30 psi range for great cooling. 30 psi give evaporative temperatures of 28*F where 80psi more like 85*F. Then CCOT systems would constantly cycle, if you were lucky enough, that 0 to 3,000 rpm almost instant accelerator wasn't good on either the compressor, clutch nor belt drive train, where the POA system only switched on once per drive. Did have a 65 Buick I put over 300 K miles without AC problems, well the blower, but then you could buy brushes for 25 cents a pair and even new bushings, and they had screws holding it together. It also lost about 12 ounces per year, but with R-12 selling for 50 cents a pound, wasn't worth the effort to find that small leak, it never got worse. How things have changed today! Then they even made the system where you could move the AC components aside without discharging it, even to pull an engine, that is also ancient history. Have fond memories of those days, more like headaches today, and they call this progress. You are right that the AC systems in the 1968 through 1982 vettes are marginal at best. I own a 71 and 76 vette. A couple of years ago I upgraded the 76 vette with all new R134 components, replacing the VIR with a fixed orifice tube, drier, new hoses, etc. After spending about $600, it blows about 55F max out the vents. The compressor cycles often, so at idle the motor is continuosly surging up and down. I am very disappointed to say the least. According to what I have read the R-12 gets the vent temperatures down around 45F and the R-12 is a continuous running system, so that's why I chose it. When I first got this R-12 system up and running on the 71 vette, it was making 45F vent temps with 85F ambient conditions. Then something happened as I was driving along on the highway and it quit blowing cold. I don't know if the evaporator froze up, or the POA valve stopped working, or the TXV quit working, or what. I turned the AC system off and drove it on to the hotel. The next morning when I got in the car I gave the AC a try and it was working again, but only blowing 55F vent temps. That's the best it will do now. I want to figure out what is different (malfuntioning POA or TXV, or leaking freon, or whatever). Based on my readings so far, I think I still have a full charge of freon. The only moving parts are the TXV, POA, and compressor. I see high enough readings from the compressor so I think its fine. That leaves the TXV and POA valves. The TXV seems to be working based on yesterdays tests. That leaves me thinking its the POA. I tested it with air before putting the system in service and it was giving me the correct outlet pressure of 30psi. I think either some trash was left in my system that is affecting the POA or possible TXV, of that the POA broke and is no longer working. I believe the POA valve has orings, springs, and plastic pieces in it. Maybe being 40 years old it gave up. Can anyone explain what's going on? I am very excited with these temps. I was getting similar readings last week when the ambient temp was 72F. However, when the ambient temp is higher, my low side pressure is also higher along with the vent temp. Is this normal? Is this what I should expect? Did I screw up? Reading about mineral oil. I used regular mineral oil from Walgreens. Not anything special. What will that do to my system? For what it's worth, you are not the first. I remember almost using it on my first MVAC repair, I forget what warned me off. Probably the good folks on here. Either way, good for you for bringing it up; it will help others down the road. I've only used refrigeration R-12 oil (called mineral oil). I have no idea if it's similar to drugstore mineral oil, never thought about not using the correct stuff. There's all sorts of viscosities to drugstore mineral oils, dependent on the paraffin carbon chain length. I never called R-12 refrigerant oil mineral oil, and never even heard it called that until coming to this board, actually, the old airconditioner. com board, this board replaced. Being some kind of a purist nut, would only use the oil from the same vehicle manufacturer, may cost a buck or two more, but a lot of money in an AC system, in particular with Honda that uses all kinds of strange oils. Recall GM recommends a 525 viscosity refrigerant oil for R-12, but don't recall the stock part number of it. Came in an 8 ounce bottle. Do have a bottle of Walgreens mineral oil, good for constipation, but tastes like crap, never tasted 525 oil, never wanted too. The drugstore oil might be a problem by forming gel or wax at low temperatures. You could test that theory by putting a sample in a freezer. Besides its unknown and potentially unstable viscosity, it wasn't intended to lubricate metal parts. Like other lube oils, refrigeration oil should contain many additives besides just petroleum. Yeah, I figured I screwed up somehow. I got conthused when I read a post saying you could flush it out with regular store bought mineral oil. Somehow I applied that to also using regular mineral oil to fill up the system after flushing. Well at the moment my compressor is still producing 175psi on the high side so hopefully I didn't hurt it. The mineral oil might be getting cold and not letting my valves open and close as easily as they should, leading to the poor performance I have been seeing. Each time I crank my car the AC blows very cold for the first 10 to 15 minutes then it starts not blowing as cold. 1. Remove head from azz. 2. Have someone remove the R-12 for me so I can reuse it. 3. Remove condensor and flush it. 4. Remove the AC lines and flush them. 5. Remove POA and TXV and flush out the evaporator. 6. Remove AC compressor and drain it. 8. Install POA and TXV on evaporator. Test with shop air to make sure i'm getting 29psi out of POA. 9. Put it all back together and put in the correct mineral oil. 10. Pull a vacuum and charge it back up. I read where someone set their POA for 27 to 28 discharge pressure to make their system even colder. Is this a good idea? Does it work? Anything else/special I should do for any of these steps. Could quit calling it mineral oil and calling it R-12 525 viscosity refrigerant oil. Didn't read anything about replacing the receiver, that has got to be contaminated, but shouldn't have to be concerned about it being constipated.